Platelet Rich Plasma Therapy (PRP) has been in use for innumerable for treating muscle and ligament injuries, skin lesions as well as pain problems in orthopaedics and sports medicine. Collagen is what gives skin a firm, youthful appearance. As we grow old, less collagen is produced, causing sagging, wrinkles and soft tissue depressions in the skin. Due to the success of PRP in medicine, the procedure was then developed into an ant-aging treatment designed to encourage new collagen production, reduce wrinkles, and diminish the visible signs of aging by growing new healthy tissue. PRP is a safe treatment because it uses patient’s blood. It is therefore considered a natural treatment procedure to slower the process of aging, which can result into a brighter and healthier skin. 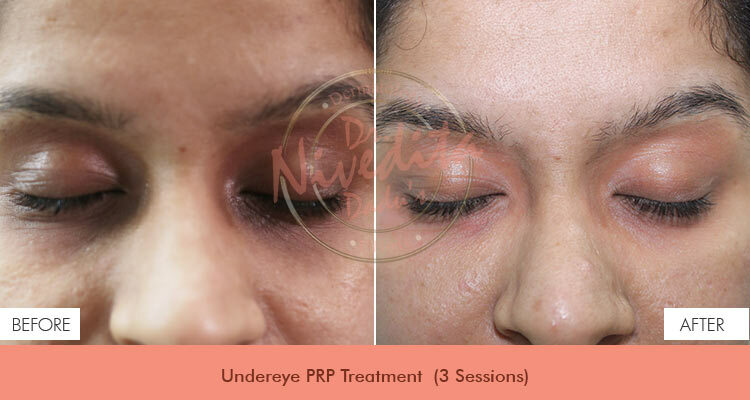 The PRP therapy works by stimulating the collagen to repair the damaged skin cells in the problem areas. PRP can be used on the face, neck, décolletage and hands. The number of treatments required is different for each patient. We recommend 1-3 treatments administered at a gap of almost a month until the optimum result is achieved, followed by 1-2 maintenance treatments per year. At the time of treatment, few results are visible immediately, while there is usually a return to baseline within a week as the PRP is absorbed back into the body prior to the complete action of the cellular regenerative process. Most patients see improvement in the following weeks with long lasting results. Platelet Rich Plasma (PRP) treatment, also called as the 'Vampire Facelift' or 'Dracula Therapy' is based on the principle that your own body has the potential to naturally heal and slow down the process of ageing; it’s a revolutionary repair system that places growth factors in the exact location where we want the skin to repair and revive itself. The treatment includes infusing the platelets in the problem areas of the skin which is extracted from the patient’s own blood. Now to separate the red blood cells from the platelet rich plasma, blood is placed in a centrifuge and spun down. Platelets are rich in the “growth factors”, meaning the proteins that help in healing the injured or damaged skin tissues. The platelets release their growth factors upon re-injection which trigger surrounding cells to multiply, in turn stimulating repair, increasing volume and rejuvenating the skin. You need two to three top-up sessions after your first treatment. On your first visit to our clinic, Dr. Nivedita will examine your skin and take a detailed medical history to make sure there are no reasons why you should not have the treatment. You are expected to explain your concerns and expectations from the treatment. She will then explain the various treatment options available for your concerns. If you wish to get PRP you will be asked to read and sign a detailed informed consent from. Photographs may also be taken by us for a “before and after” comparison of the treatment. Before beginning the procedure, Dr. Nivedita will draw 8ml of blood. This is done in a similar way to when you have blood taken for testing at the doctor’s clinic. Now to separate the red blood cells from the platelet rich plasma, blood is placed in a centrifuge and spun down using one of the branded systems described. By using a wipe, any makeup on the skin will be removed, and antiseptic will be applied to the injection site. A topical local anesthetic will then be applied to the skin of the injection site. Once injected under the skin or applied topically onto the skin, the PRP releases growth factors in the body activating multipotent stem cells in order to produce new and young skin tissues. This new tissue synthesis includes new collagen for firmness and flexibility, new fatty tissue for plumpness and softness, and new blood vessels for a healthy rosy glow. An ice pack may then be pressed onto the treated site to reduce any swelling. The results of PRP Therapy may take a few weeks to show visible results. However, you can expect long-term results; up to one and a half years after 3-4 sessions of the treatment. This is a safe treatment and includes no risks as the PRP via injections and/or topical uses the patient’s blood cells. The procedure doesn’t involve any added preservatives and therefore the skin is very responsive to this treatment. Smokers have less positive response to this treatment than non-smokers since the toxins in cigarette smoke block the response of the stem cells. Swelling - An ice pack may be placed over the area until swelling subsides. Itching - Temporary and generally intermittent. Bruising - Bruising may develop immediately or within a day following the treatment and is always a possibility with any skin injection. To decrease the danger of bruising, avoid aspirin, anti-inflammatory medications, and herbal supplements, including vitamins, for one week preceding and after your treatment. If you experience bruising, it will generally heal within a week and may be covered with makeup if needed. Pain/Tenderness - May last up to couple of days.